Comments: A blast to play. I can't pass up a new Yuji Naka game, no matter what. From his Sonic the Hedgehog games to Samba de Amigo to the beloved NiGHTS: Into Dreams, for sheer imagination, he's up there with Shigeru Miyamoto, as far as I'm concerned. Thus, when I heard a new project had been announced for the GameCube from Sonic Team (Naka's development crew), I could hardly suppress my excitement. I was particularly stoked after discovering that Billy Hatcher was going to be an original title instead of a sequel to an older franchise. I was ready for something new, though what I got wasn't as earth-shattering as I had hoped. I don't mean to imply that the game lacks originality, however. As Billy Hatcher, it is your task to save a fantasy realm from the evil Crows. The foul fowl have incapacitated the roosters of the world, bringing about an unnatural, endless night. Using various eggs you find scattered around each stage, you must nurture and hatch them, gaining the special abilities they bestow upon you to help defeat the crows. It's not going to be easy, though. Using dark magic, the crows can transform into powerful enemies, and eggs aren't exactly unbreakable weapons. It's going to take skill, practice, and effort to take out the crows and restore daylight to your world. Luckily, Billy is up to the task. The story is a bit campy, but that's what you get when you're given the role of a young boy running around in a chicken suit. 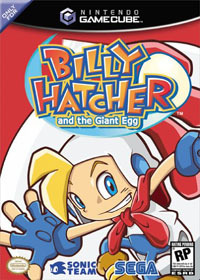 While Billy Hatcher and the Giant Egg follows the same pattern every 3D game has held since Mario 64, the control scheme is unique with the addition of the giant eggs, making this a different gaming experience than other 3D platformers. Sadly, the unique gameplay introduces the primary problem with this game - it can be frustratingly hard to get the darned eggs to do what you want them to do. Many events require expert accuracy, and one mistake will cost you a life before you can blink. Most eggs are easily replaced, but some are required to complete a stage, so it can be terribly annoying when you keep dropping or breaking an egg and forcing a restart. It's also tricky to drop the eggs when you want to. This is most irksome when you encounter an instance where you'll be required to place an egg on a rolling track and catch it later on. I'm not sure how many times I walked an egg up to the track only to have it slip through the bars, fall to its untimely demise, and end the stage prematurely. I do know I died enough sometimes that I had to stop playing for a while and return to the game after regaining a Zen composure. After all, I didn't want to throw my WaveBird out the window. It's probably not healthy for the little controller. Control-related frustrations aside, this is a fine game. For the most part, control isn't an issue. There are a few key instances where it is blatantly offensive, but most of the game runs exceptionally smoothly. Speaking of smooth, the graphics are a sight to behold. Lively colors, incredibly imaginative character and enemy designs, and some excellent animation running at 60 frames per second make this one of the prettiest GameCube games you can find. There are tons of unique eggs to grab and raise along the way, and you'll eventually have little trouble telling them apart. Elemental effects (wind, fire, etc.) are superb, with the water animation algorithms looking especially impressive. The music is also impressive. The catchy tunes will follow you long after you're done playing the game, and you may find yourself humming them days later, whether you want to or not. Sound effects are sharp and appropriately cute for the game, as well. This is one of the few titles to provide Dolby Pro Logic II surround sound encoding, so those of you with a DPLII-ready receiver can enjoy 5.1 channel sound while playing the game. Billy Hatcher also includes a versus mode for multiple players, though I was too addicted to the single player mode to feel like letting others play against me in the multiplayer aspects of the game. In the end, this game isn't as imaginative as NiGHTS, as innovative as Samba de Amigo, or as much of a genre-defining work as Sonic, but it's fun nonetheless. Its level of difficulty belies its apparently young targeted age group, but you'll keep on playing it no matter how often you die. For that matter, you really don't need to be a kid to enjoy this title, either. You need only a delicate touch for handling those eggs, some perseverance, and a small bit of childish wonder lurking somewhere inside. I may have expected more from Yuji Naka, but there remains hope that a NiGHTS sequel will appear one day. One can dream, at least.